We Are the (Reserve) Champions, My Friend…. Let’s just say our first experience with show rabbits was a learning one. When the big day arrived to take our animals to the county fair, my elder son Jack graciously offered to take them for us and get them “signed in.” I’m sure the fact that our school counts all fair related business as a school activity (a free day off) had nothing to do with Jack’s generous offer. In any case, I was grateful that I wouldn’t have to haul all five show bunnies in the back of my Suburban. Messy. I got their food and water bottles together and wrote down each rabbit’s name so that Jack would be sure not to confuse Blossom with Penelope or Claudia with Cornelius. By lunch time the frantic text messages from Jack, whose farming interests lie entirely with the buffalo, began. What kind of rabbits are these!!! How old are they? Are they boys or girls? Apparently, fair judges don’t care which one is Penelope and which one is Blossom. Jack recovered from the embarrassment, fair week was under way, and we managed to continue rest of the process (which consisted of a daily trip to the fair to feed them) with dignity. In the end, our rookie mistakes didn’t hurt us a bit. Two of our rabbits won blue ribbons and Penelope was crowned Reserve Grand Champion – apparently that means that if for any reason the Grand Champion is not able to continue her reign (death, injury, embarrassing photos) our Penelope will step (ahem, hop) up and take her place! Actually, we did make one rookie mistake we are kicking ourselves for. Turns out we didn’t know a Grand Champion when we had one. The winner was the offspring of our very own Claudia and Bandit. We had given her away just weeks before. 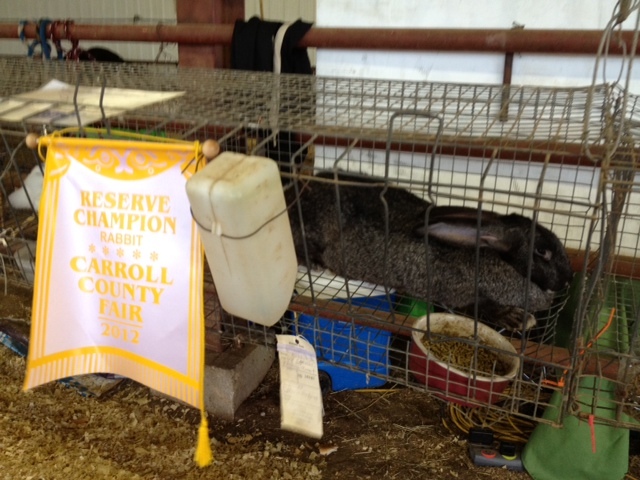 Oh well, at least we can say we are Grand Champion rabbit breeders. We can’t wait until next year!